The RF312Glycol Diligence WiFi Glycol Simulant Data Logger (detachable buffer probe) is designed specifically for use in monitoring the temperature of perishable items, such as Food, Samples and Vaccines. The high accuracy data logger is typically accurate to ±0.2°C (-15°C to +80°C) / ±0.4°F (+5°F to +176°F). Data is streamed wirelessly over any WiFi network and can be viewed locally on a PC using our free software package, or from anywhere, using the Comark Cloud. The Glycol Buffer Probe is designed to provide a buffered response to changes in temperature. This helps to simulate the thermal lag experienced by products stored in the monitored environment. During configuration, the data logger will search for an existing wireless network whilst physically connected to the PC. It can then be placed anywhere within range of the network. If the data logger temporarily loses connectivity with the network, it will log readings until it is able to communicate again with the PC application or the Cloud (max 30 days at 10 second sample interval). Although the WiFi data loggers have an impressive range this can be increased by using WiFi extenders. The RF312Glycol Diligence WiFi Glycol Simulant Data Logger is a battery powered device with an internal rechargeable lithium polymer battery, but can be permanently powered using an RF320 USB power supply (available separately). 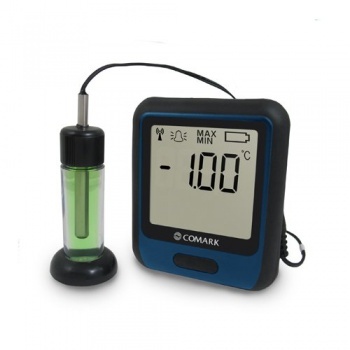 The LCD display includes several features including Max and Min readings and indicators for low battery, alarms, WiFi connection and signal strength. The RF312 has a protection rating of IP43 and the glycol probe, IP67. The RF312 is freestanding, but can be attached to a wall or surface using the bracket provided. The glycol buffer probe is supplied with a detachable magnetic base for easy installation. The data logger is IEEE 802.11b/g/n compliant, supports WEP, WPA/WPA2 encryption and enterprise networks*. Comark has upgraded the Diligence WiFi Data Logger range from ‘B’ (IEEE 802.11b) to ‘BGN’ (IEEE 802.11b/g/n) WiFi compatibility. One of the major benefits of the switch to type ‘BGN’ WiFi is that it speeds network communications. IT departments in many schools and hospitals have been turning off ‘B’ compatibility to improve network speeds, so ‘BGN’ devices are often all that they will consider for new network devices. Logger Dimensions Height 82mm / 3.23" x Width 70mm / 2.75" x Depth 22mm / 0.86"